We’ve all heard the saying that goes, “You don’t know what you got ‘til it’s gone”, and the same is true for small end tables. Whether it is for your living room, bedroom, office space or even your bathroom, a good bunch of side tables for small spaces can be just the thing you need to stretch your storage or unify your room design – and without them you’ll definitely feel the difference. When you try to set your cup of coffee down, lay out magazines or arrange some snacks for guests, you’ll always wish you had the extra space. And it’s not just about storage anymore either. A telephone table, apart from its obvious function, also creates an effect on the look and feel of your interior depending on its design. An artistic set of mini tables can provide a welcome splash of colour in a grey-walled room, or a single intricately designed lounge side table can be the perfect accent to your clean and modern sofa set. We boast a collection of sidetables that suits all of these preferences. If extra storage is your priority, go for sidetables with compartments, drawers, or cabinets. For example, a console table we offer like the ‘Blanco console’ by Woodman can sit perfectly well against the wall or behind your sofa for easy access to its drawer and tabletop. Our ‘Natural Wood Side Table’ by Oitenta can tidily store your books and gadgets within its spacious drawer, while being easy to move around with its unique “carry” function. 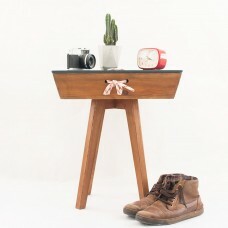 The ‘Trellis’ storage side table by Muemma features wooden slats that function as device and book/magazine holders; and the ‘Eclipse Table’ by the UK designer Vitamin Living has a rotating wooden top that exposes a tray-like recess underneath where you can neatly tuck your beverage or smaller items. Check out the rest of our collection to see more of these beautiful, one-of-a-kind pieces. A piece of furniture can never achieve its fullest appeal without balancing both ease of use and aesthetic quality. We’ve selected only the pieces that have met this standard especially for sidetables. If you are looking for the smooth look of a spacious glass side table, our designer TEO offers this in copper, brass and polished stainless steel tabletop finishes. For clean lines and a subtler appeal, our ‘Batea’, ‘Jupiter’ and ‘Pedestal’ designs might be the answers to your tripod side table needs. Dark oak or pine wood, matte or polished metal, the variety of our small side tables for living room, bedroom and workspace uses will satisfy any furniture palate.